To celebrate their 25th anniversary in the rock business, Sweden's Angeline offers fans a special four song EP Life, available only by digital download. As you would expect, and typical of the Angeline, they offer solid melodic rock in the AOR tradition, especially found on the first to cuts Life and Can You Feel It Now?. They get a bit edgier on the third tune Into the Fire. The final number, Days Go By, is a quieter piece, a ballad where the guitar line is enlivened by mandolin. Overall, Life is a nice set. Yet, I'm sure anxious fans will be wanting more, and soon. Recommended. 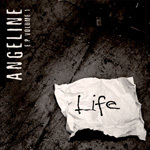 To celebrate their 25th anniversary in the rock business, Sweden's Angeline offers fans a special four song EP Life, available only by digital download.